I'm doing it. Finally. My first half-marathon ever. I probably said 100 times that I wanted to do it but I never signed up for a race, but now I did so it's official. I'm kind of nervous because 1) it's in 6 weeks, 2) I can count on one hand the number of times I went for a run in 2017 and 3) I've never run a distance longer than 13 kilometers. So if I want to successfully complete those 21.1 kilometers, I have a lot of work to do. The idea of running a half-marathon in New York had been playing in my head for a while, but the "official" one seemed to be quite hard to get into (there's a lottery). I mean, I'm not a huge fan of running and I'd rather do other sports than run. But my last 10K race in London was so much fun that I knew I wanted to do it again, only this time it had to be a bigger challenge. One day I'd like to run a full marathon, just to prove to myself that I can do it and it's kind of a typical bucket list thing. So I have to start somewhere, and a half-marathon is the logical thing to do. So after my run on Wednesday, I spontaneously signed up for the Women's Half-Marathon in Central Park on April 30th. Because I had no idea where to start in terms of training, I asked the running queen herself, Annemerel, to make me a schedule. I kind of had a tiny heart attack when I saw the schedule but I'm going to try my best to somewhat stick to it because I don't only want to reach the finish line, I also want an acceptable time. She recommended me to go for three runs per week, one 7K, one interval training and one long distance run (starting at 10K up to 18K). I started training this week (see my timings in the picture above), I'll let you know how I get on! 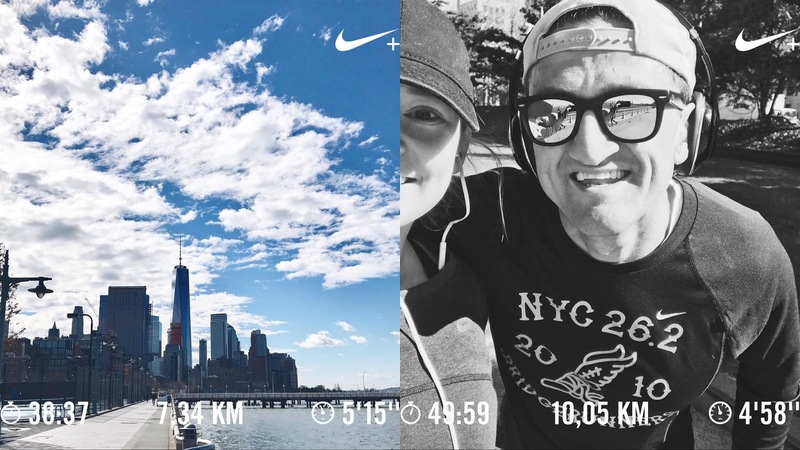 In other news, at the start of my second training yesterday I ran into someone I'd never expect to run into: Casey Neistat. I'm pretty sure you all know who he is, and if you don't, shame on you. He's a big inspiration for me when it comes to running (just watch this video), and generally everything he does is inspiring. So when I saw him running towards me, I yanked out one earphone, said "Hi Casey!" and asked him for a quick picture while we were both half-running. I didn't want to disturb him on his run so it was a very short encounter but still I MET CASEY!!! I had a big smile on my face during my whole run and felt more motivated than ever. My half-marathon training couldn't have started in any better way. I'll keep you posted on how my training is going, wish me luck! Although some people think I'm crazy for signing up for the half-marathon so last-minute, I can only think of Casey's words, do what you can't.